So it's Monday and you have your son or daughters birthday party that they're so looking forward to this week. They have already called all their friends, relatives and close neighbors, wait a minute you think, what am I doing for setup and serving? I have got to do something special for this little one, something that everything will go home remembering it and one that he or she will also remember and be thankful for (don't expect very much appreciation for the little one, they love you anyway). 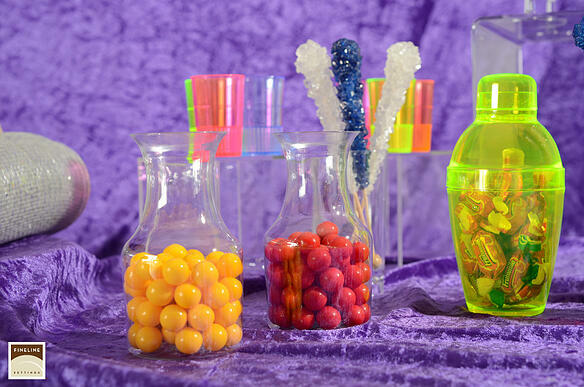 Worry no more, we've got some amazing ideas to share with you, we'll start with our Candy Buffet setup, it's easy to do, fun to look at and kids and parents will love it too. All you need is a little bit of candy that can be purchased at the nearest Party City store some mini disposable partyware products, a fun tablecover and you're ready to start. As you can see, bu using these mini disposable partyware products we not only have given ourselves a bonus that everything looks so cute, we also now have a portion control feature since there's just so much that can go into these small products and we really don't want the kids to stuff their mouths with so much candy. In this shot we've added some creativity, look at these adorable mini carafe - pitchers, you normally would associate them with wine or any other drink, by getting a bit more creative your can once again have a nice portion control and in a beautiful presentation. These carafes can be wrapped with ribbon or bows to add a party look and feel. 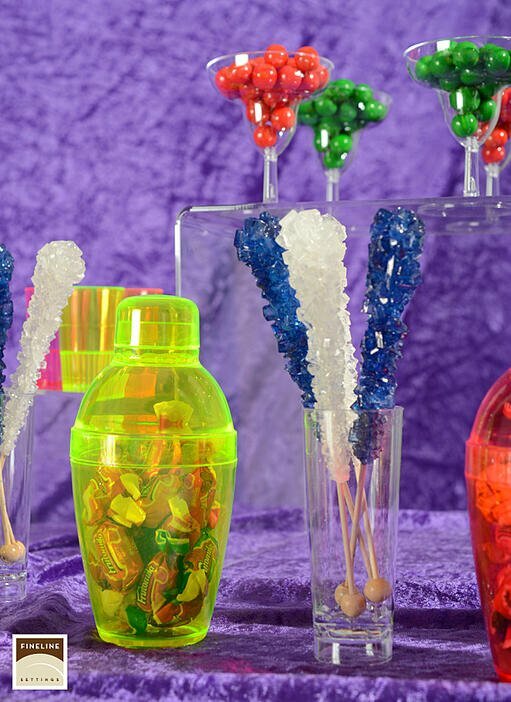 Here you have it, setting up your next birthday party with premium upscale disposable partyware and creating the most perfect candy buffet display table. There are no dishes to wash here and no glass to be cracked or broken which is always a winning proposal. How would you setup your next fun party with disposable partyware? We want you to chime in. Send us a note or post a comment below.